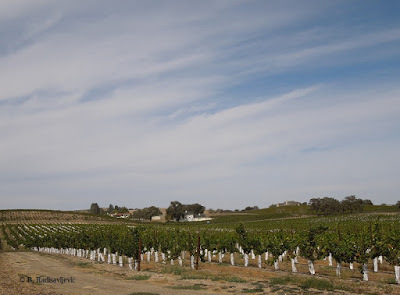 On Sunday I decided to photograph some of the newly planted vineyards along Highway 46 West. I had noticed one going in at Summerwood, so I parked and walked over for a closer look. 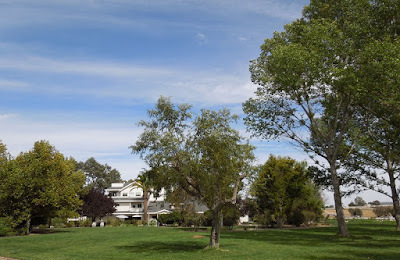 This photo shows the way the bed and breakfast inn looks from the road. On Sunday, though, I discovered a few things you can't see by just driving by. Since the young vineyard was on the other side of the inn, beyond the lawn, I decided to walk across the lawn to get there. I didn't want the fence by the road blocking my view. As I began to walk across the lawn I had some misgivings when I saw this. The entire lawn looked like this. A closer look showed me these were not doggy presents, but instead soil plugs from a newly aerated lawn. You can click the photo (or any other on this page) to see it full size in more detail. 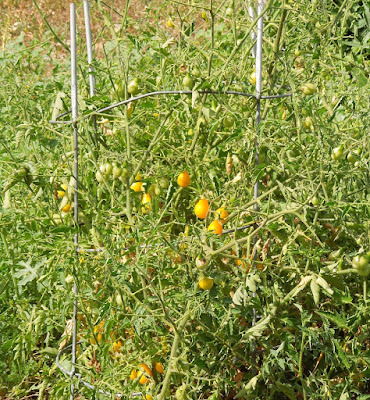 When I got to the other side of the lawn, I was surprised to see a vegetable garden. It would appear that it supplies some of the produce used by the chef. I know there were heirloom tomatoes still growing. These are yellow pear tomatoes. 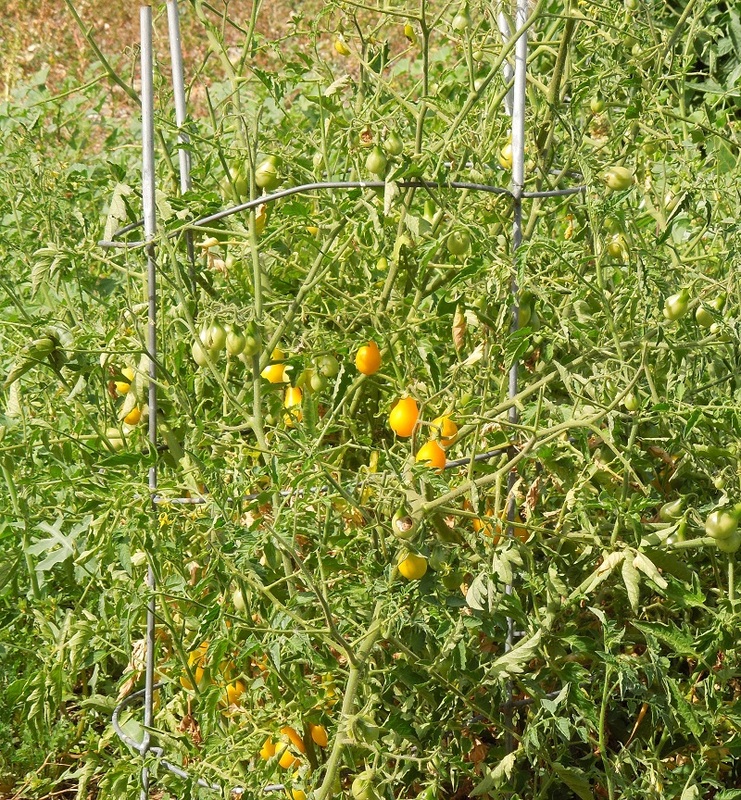 I also saw some red tomatoes that I assume were heirlooms. 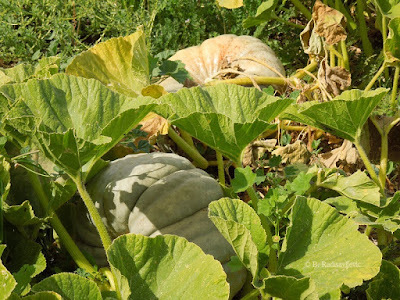 Then I saw some large squashes and / or pumpkins. I'm not sure which these large ones are. I suspect they are pumpkins that are not yet completely ripe or a variety that does not turn orange. After I passed the garden I finally made it to the young vineyard. Don't forget to click so you can see the photo full size. Sunday night I started my search for the Super Blood Moon early. 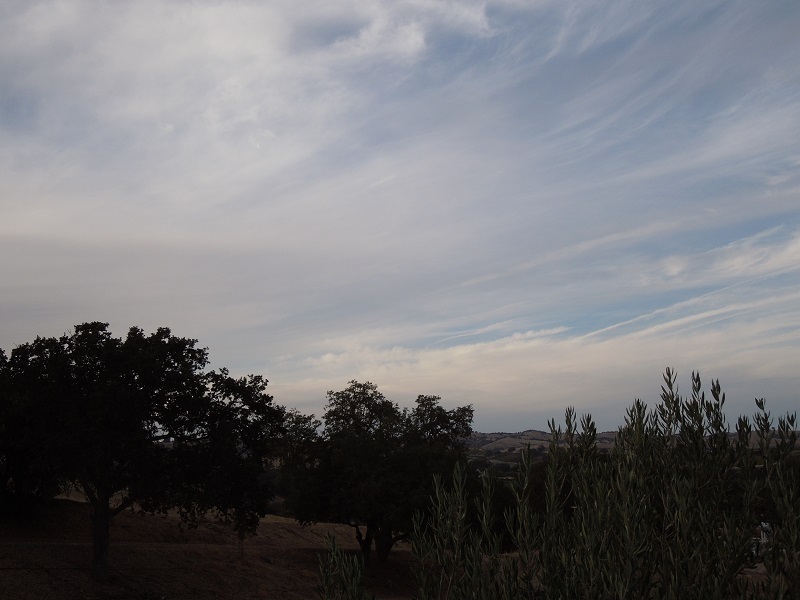 One web site said the eclipse might start before 6 PM, and I was still in 46 West Wine Country at that time. 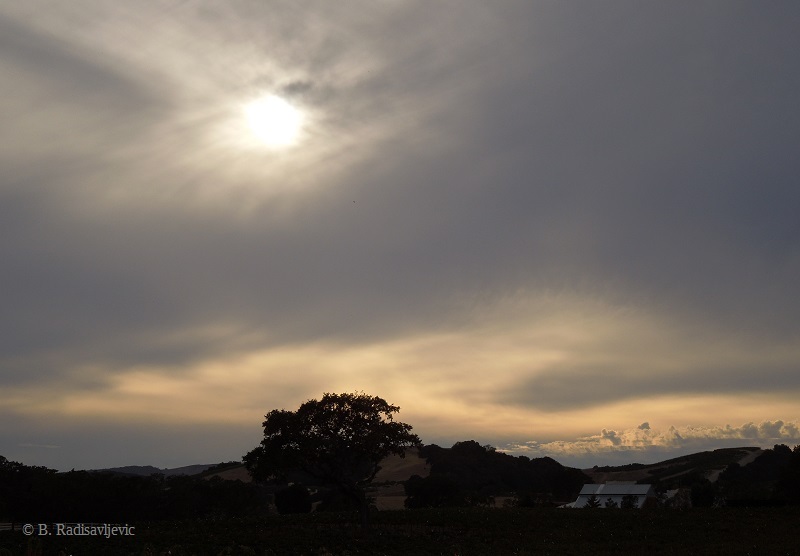 I planned to stop at my favorite sky viewing vineyards to see if the moon was up yet. It wasn't. My first stop was on Bethel Road beside the Castoro Cellars windmill. I couldn't find the moon in the east, but I did see this to the west. You will see more detail if you click any of these photos to enlarge them. I wandered across the street to where the Veris Tasting Room used to be. 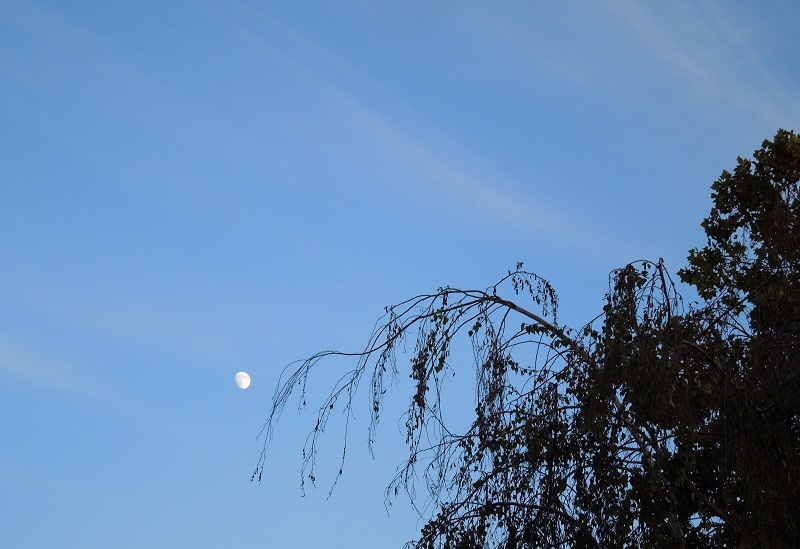 I should have known then, when I took this photo, that it would be hard to see the moon. It should have already risen and been visible here. The clouds were already covering it. This was taken withing minutes of the other photos on this page. 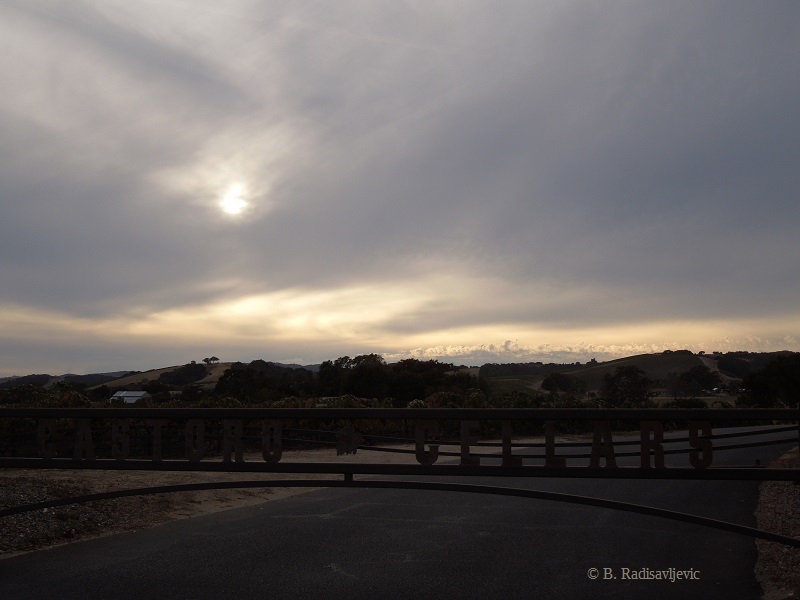 Since I knew the moon was invisible, I walked back across the street to Castoro's vineyard. 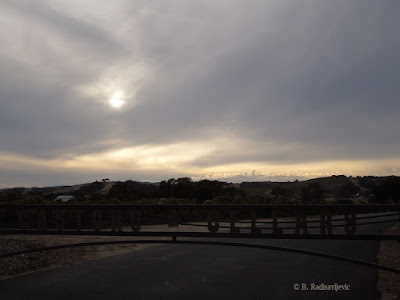 If you enlarge the photo and look closely, you can read part of the Castoro Cellars name on the closed gate. I'm hoping you will notice the low layer of clouds on the horizon on the right. You can see that layer even better in this shot. I used a zoom here, so everything looks a bit bigger than in the photo above on the left. I hope you will click this to see the full size shot. 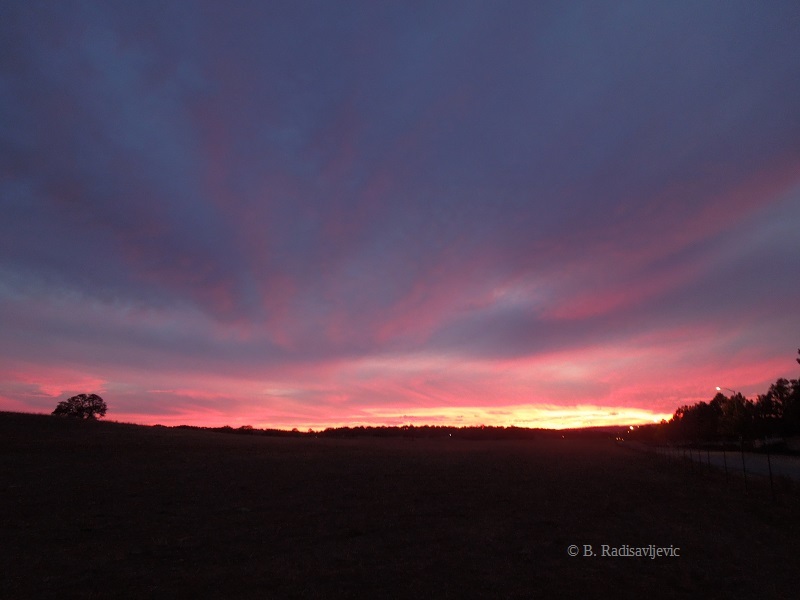 Although I was disappointed not to see the super moon, the clouds that covered it made for magnificent sunset photos. See those sunsets here if you missed last night's post. If you don't want to miss any special events in the sky, you might consider purchasing the book below -- one of the best for sky watchers. Just click below. Like many others on the West Coast, our search for the Super Blood Moon was a wild goose chase. The moon hid behind a cloud cover until about 9 PM. Those of us heading east to the rural areas when it was due only found each other out looking. I saw many other cars on rural roads surrounded by open space parked facing east. We saw no moon at all. 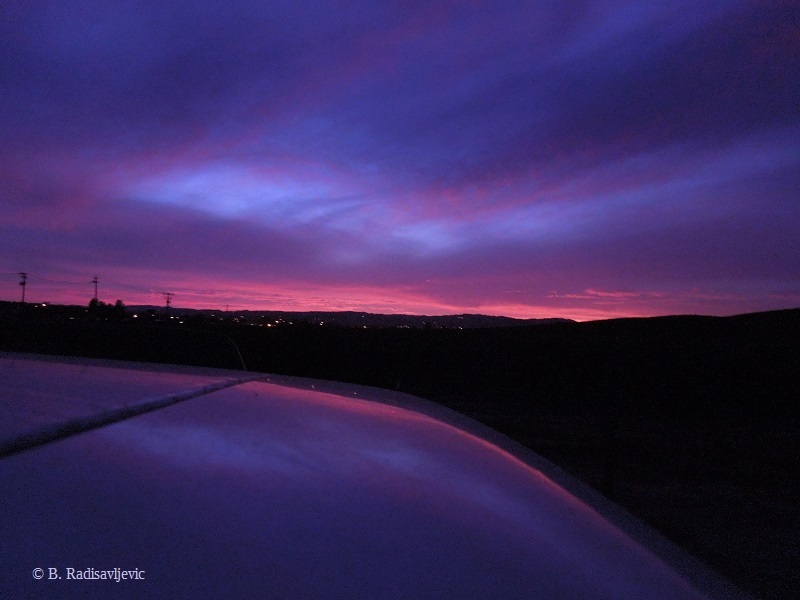 What we did see was this gorgeous sunset as we looked back west. Earlier, before I left home to chase the moon, I snapped this shot as the sun was setting. 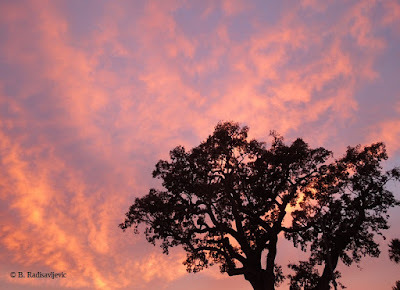 I often shoot a sunset through the branches of this oak across the street. I didn't realize at the time the sunset show would only get better. While I was parked hoping for a moon to appear, the sun almost disappeared. You can see it sneaking under the horizon here. I decided to change the setting on my camera for night photography just to see what effect it would have. 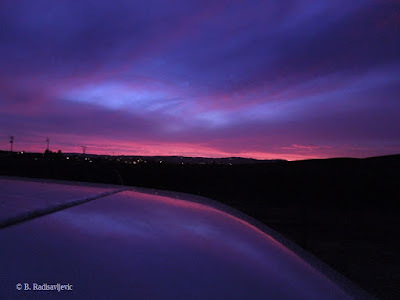 Since I had no tripod with me, I decided to rest the camera on the top of my car. I was delighted with the surprise reflection that showed up in this photo. Like most people who were chasing the super moon and the eclipse, I gave up and went home. About 9 I went outside to see if the clouds had moved. I was finally able to see the moon. My point and shoot camera couldn't capture the dark circle that made the moon look like a white bulls-eye in a target, but it was there, much larger than the moon itself. It may have been the shadow of the sun. 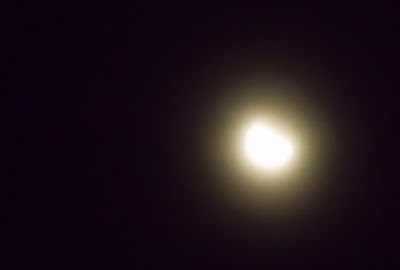 I don't know whether part of the moon is missing here because of the eclipse or whether it is just blocked by a cloud. Wish I'd had a better camera and a tripod. Please click any photo you want to enlarge. I'm patiently waiting for the days to get cooler now that autumn is here. Were I not so busy with a couple of projects that involve a lot of physical labor and a deadline in three days, I would be here today. I love Leffingwell Landing. 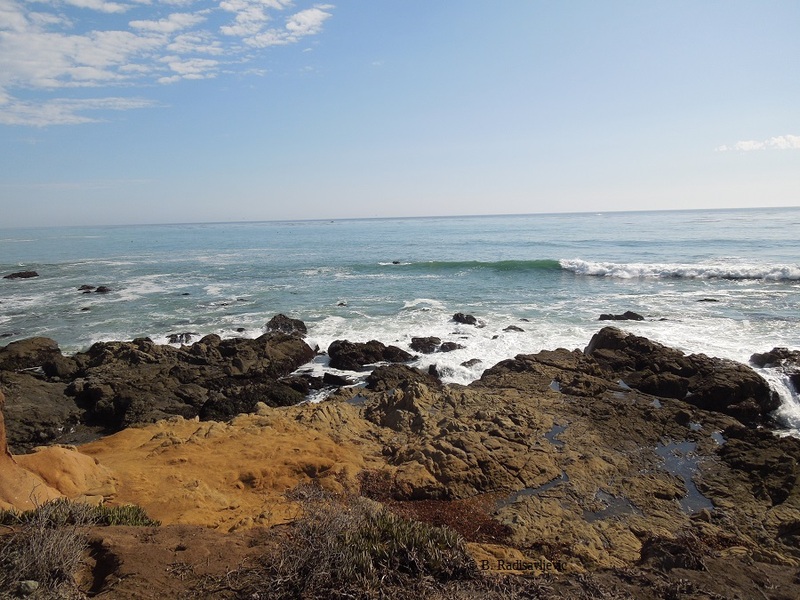 To see these waves up closer, just click the photo to make it larger. Here are more photos from Leffingwell Landing in Cambria. Where Have All the Silk Tree Flowers Gone? 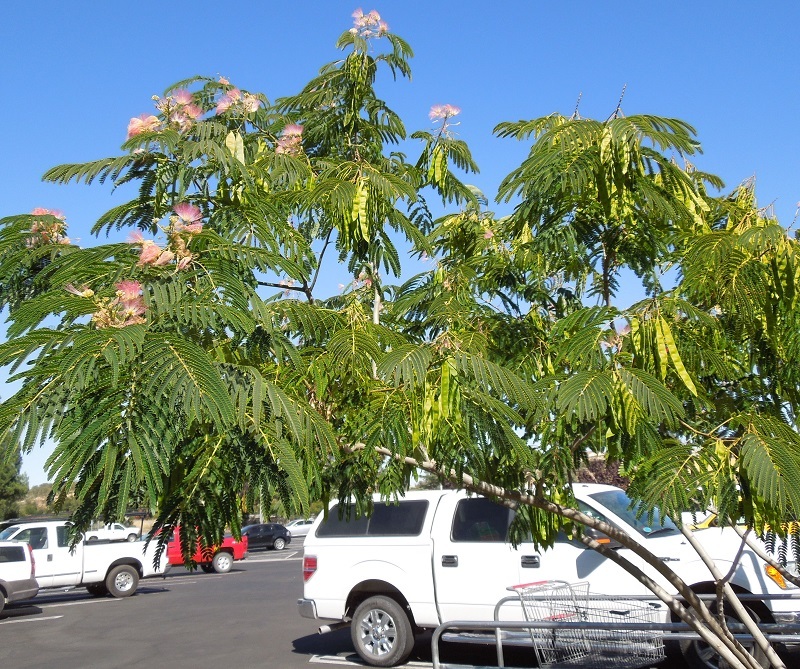 This is a silk tree I saw in the parking lot at the new Paso Robles Grocery Outlet on August 22. As you can see, it still has some flowers, but it has also started producing its seed pod fruits. 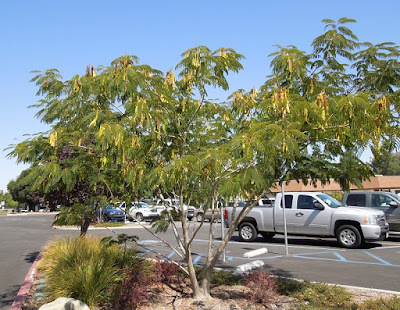 Below is another silk tree in the same parking lot on September 19. It has lost all its flowers? So where have all the flowers gone? Part on the ground and part transformed into the fruits -- all that is left but the leaves. To get a larger view of either photo, please click it. Also see, "Bee in a Silk Tree" for more related photos. Find out more about the Grocery Outlet here. The sky put on quite a show last night. I took these photos about 6:45 PM. This is what the setting sun looked like then. After taking the picture, I left for the gym to do my stationary cycling. 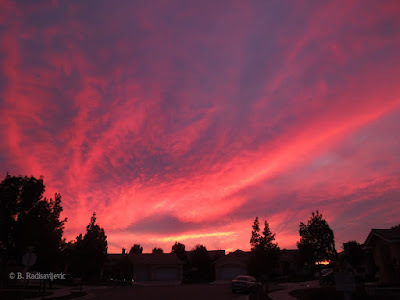 By the time I got on the bike and looked toward the west through the window at the gym, the clouds were turning lovely shades of pink and purple, but I didn't have my camera with me there. Before leaving for the gym, I also took these other photos. This first one is of the moon rising. Sometimes the sky looks as though someone got up there with finger paints. I think that happened last night, but there were only these colors while I was taking the photo. 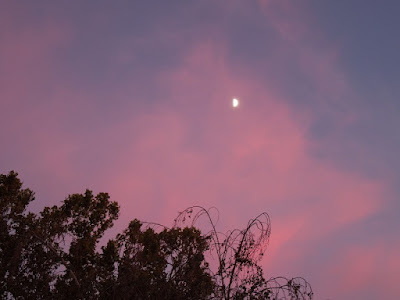 Later the colors changed to shades of pink, but I had left my camera at home. Sometimes we miss a lot when we forget to look up at the sky -- especially during the minutes when the sun is setting. Nothing calms me like a sunset. How does seeing a sunset affect you? Until I started gardening in Paso Robles, I had never seen a live praying mantis. Then, a few years ago, I found one in my yard. The one you see in this photo decided to visit me inside my house. I have no idea why. 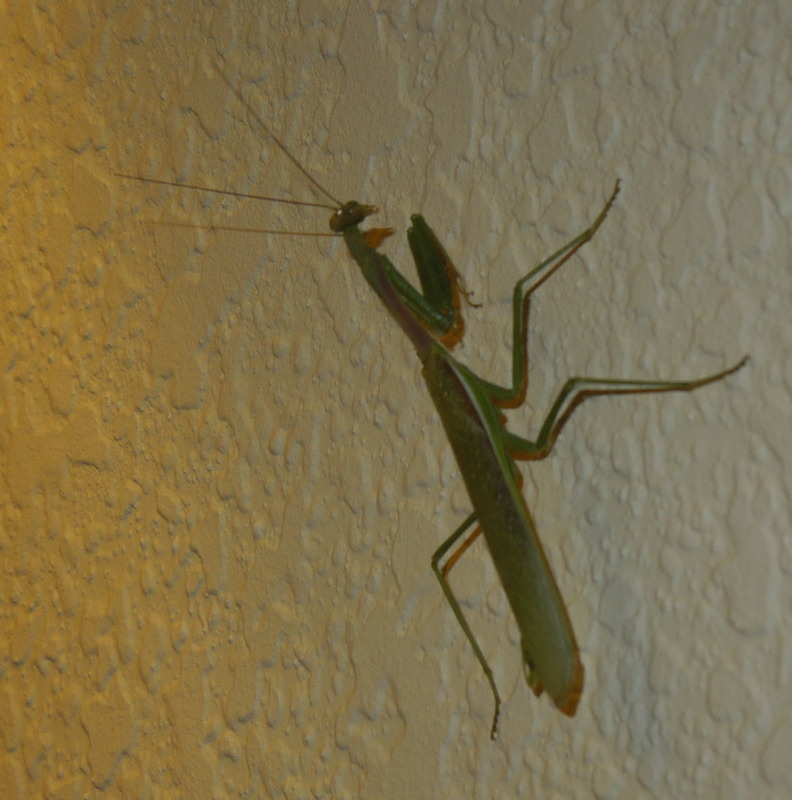 I was sitting in the family room a few nights ago and saw this one flying above me. It landed on a wall high above my head. In flight I thought it was a dragonfly. Only when I focused my zoom lens on it did I see that it was actually a mantis. Later, it moved to different wall lower down, and with some effort to get behind some furniture that was blocking decent access, I was able to get this shot. Since it was night, I had to use a flash, but there was also a lamp to the left throwing off its own light. 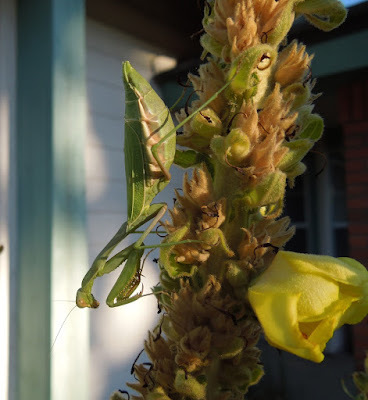 I discovered my first praying mantis in my garden one year late in October. I was trying to get photos of a mullein in bloom, and didn't even notice this mantis until I was poised to take a macro shot of a flower. 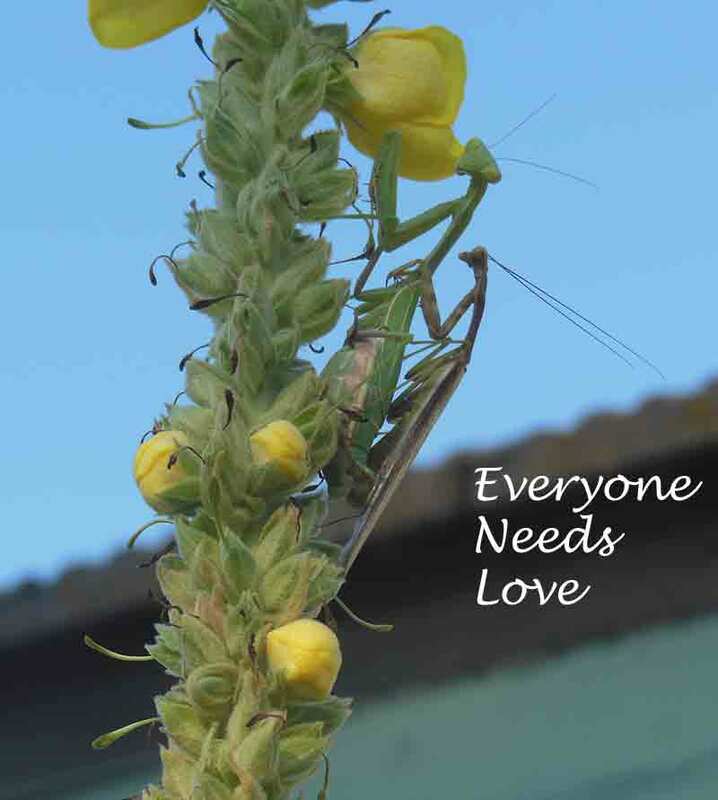 Do you see how well the colors of the mantis blend into the colors of the plant? But I hadn't seen the whole show yet. As I continued to stalk the plant with my camera, I caught a mantis pair mating, and I could not resist taking the photo below and adding a bit to it. Although the mantis is smooth in flight, it seems a bit awkward as it moves from one part of a plant to another. In the video below, I captured it moving from the flower spike it was on to the one a couple of inches away from it. As you can see, it is having a bit of a struggle making this short journey. 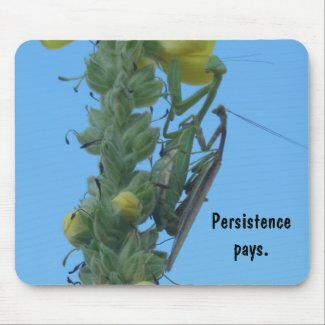 Other products with the design below are also available from Zazzle. You can change or remove the text if you wish. Most of the products are blank. I used to think the plant was clary sage because that's what the person who sold it to me told me. It was months before the plant bloomed and I accidentally discovered my mistake when I saw a photo of mullein online and in an herb book. The leaves are similar, but the flowers are very different. 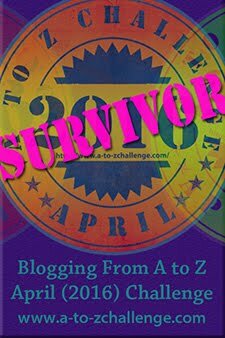 Some product titles still have not been corrected on Zazzle, but I'm working on it. I mentioned a few posts back that we had a large pine tree about to fall. It seemed prudent to remove it before that happened. I will show you the entire tree again so that you can see the contrast between the tree in the ground and the tree on the ground. You can see how tall it is compared to the six-foot fence, and of course, it's already part of the way down. 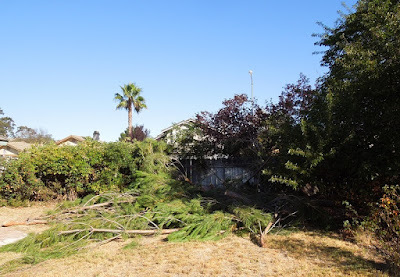 There are many ways to get rid of an unwanted tree. We chose to hire a handyman. 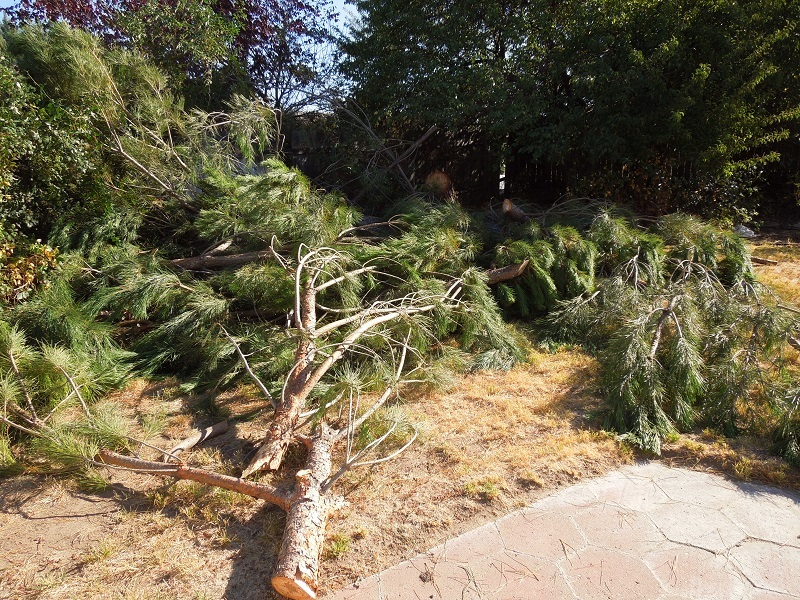 What that sometimes means is that a project may take longer than it might in the hands of a professional tree service. It didn't take two men working together long to get the tree cut down, but it's taken almost a week to get all the tree parts hauled away. I want you to see how large the tree really is by showing you its parts. 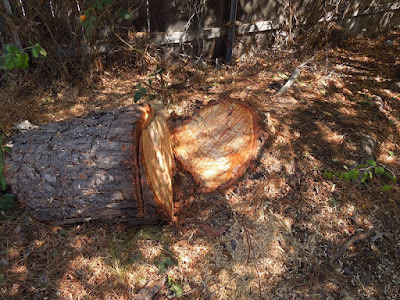 I guess I had expected the tree to be cut lumberjack style with cuts to the trunk and the tree falling whole. That isn't what happened. 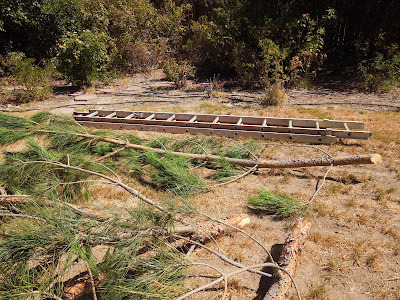 It was safer to remove the branches first to make the tree lighter. This photo shows most of the branches that were cut before the trunk. This is a view from a different perspective. You can click this or any of these photos to enlarge them. The men stacked some of the branches, though not as many, in the center of the yard, perhaps to make them easier to carry away. 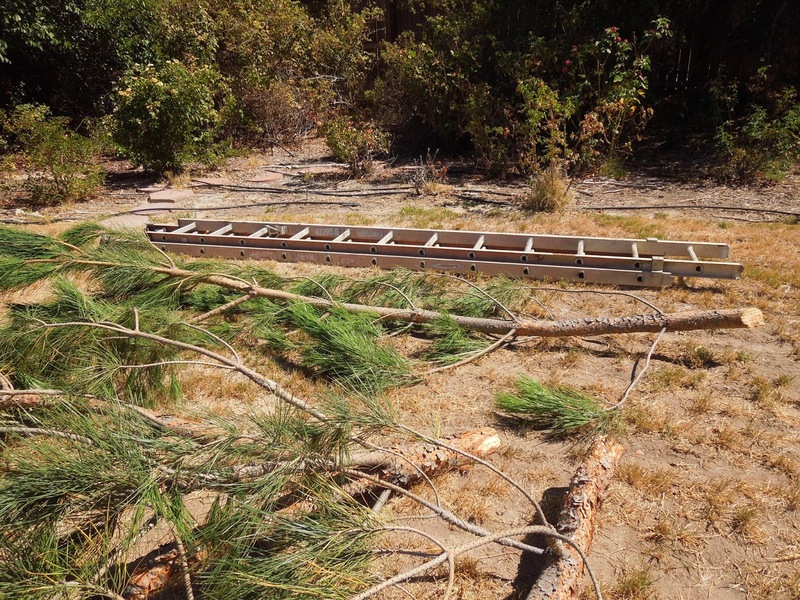 To help you put the size of the branches into perspective, I lined up one of the smaller branches next to this twelve-foot ladder. My mother planted this as a small Christmas tree. 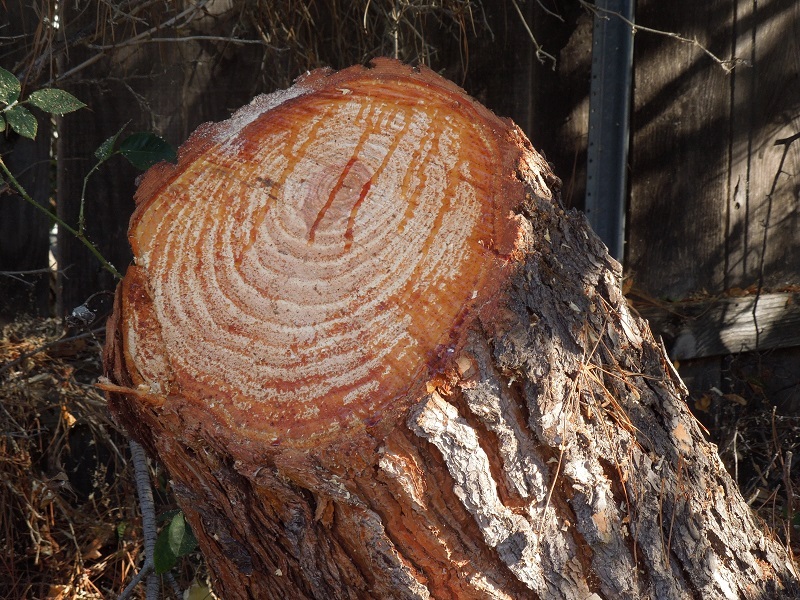 The rings on the stump indicate that was just about 20 years ago, which would have been her first Christmas here. 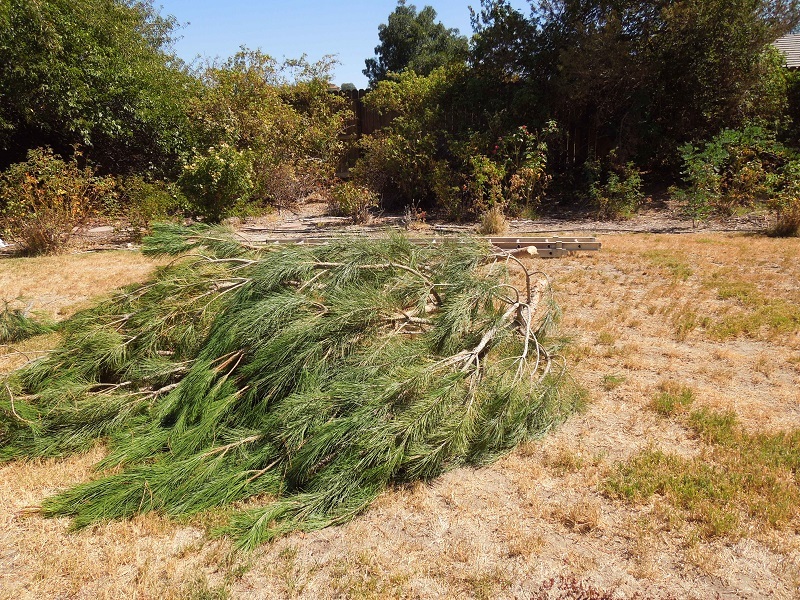 Think about these photos if you ever decide to plant a living Christmas tree, and make sure you have enough room. 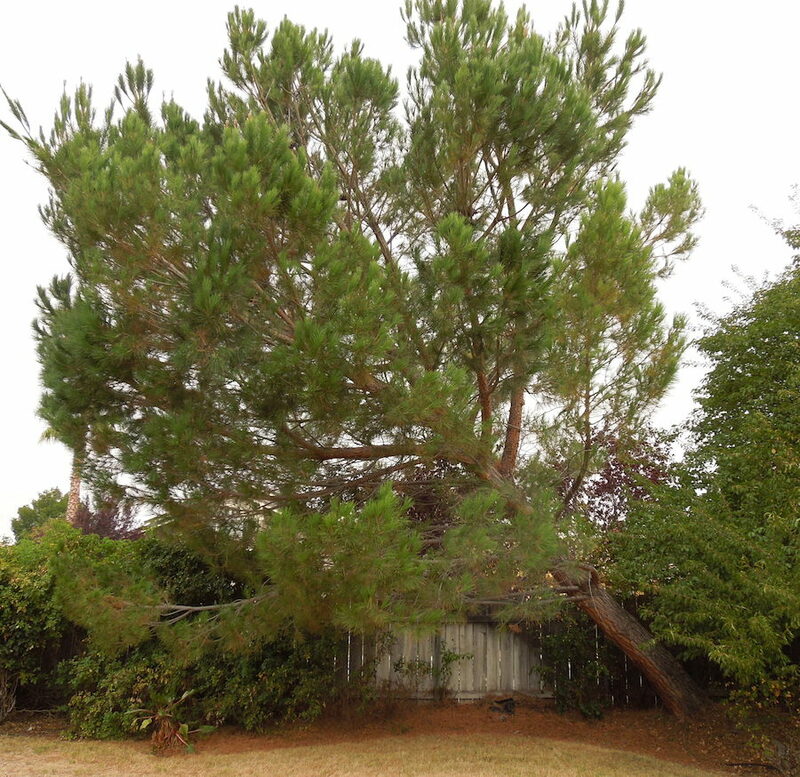 Take into account that fact that surrounding trees will also grow larger, and that pine trees have shallow roots. The stump was cut away to ground level a couple of days after the initial cut. I'm hoping you will be able to see a couple of the roots in this photo to the right. One of the roots is toward the right between some green leaves about 2/3 of the way down. The roots are hard to see because they blend so well into the pine needles and shadows. You will have to click and enlarge the photo to see them. 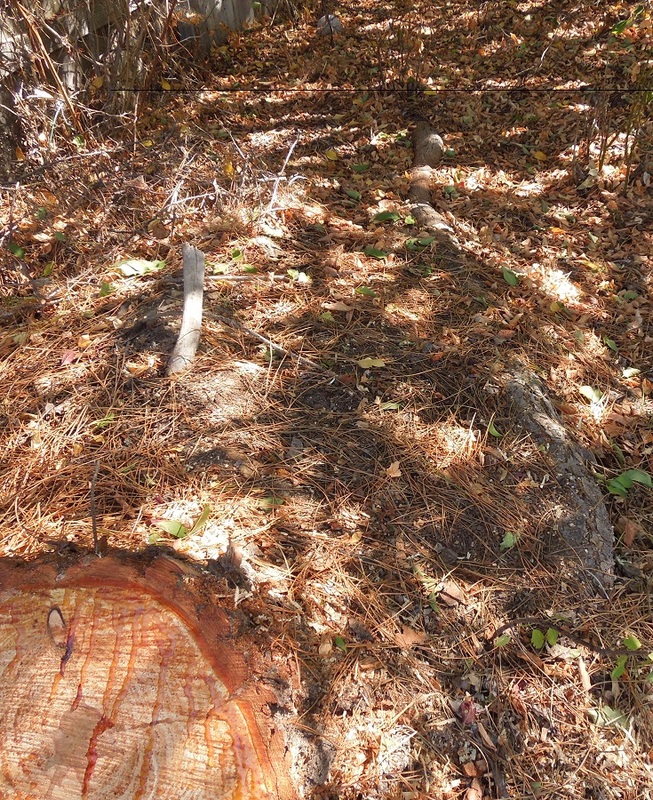 If you follow the line of that root back past where some pine needles cover it, you will get a feel for how long it really is -- about eight feet. It heads back underground at a rosebush. 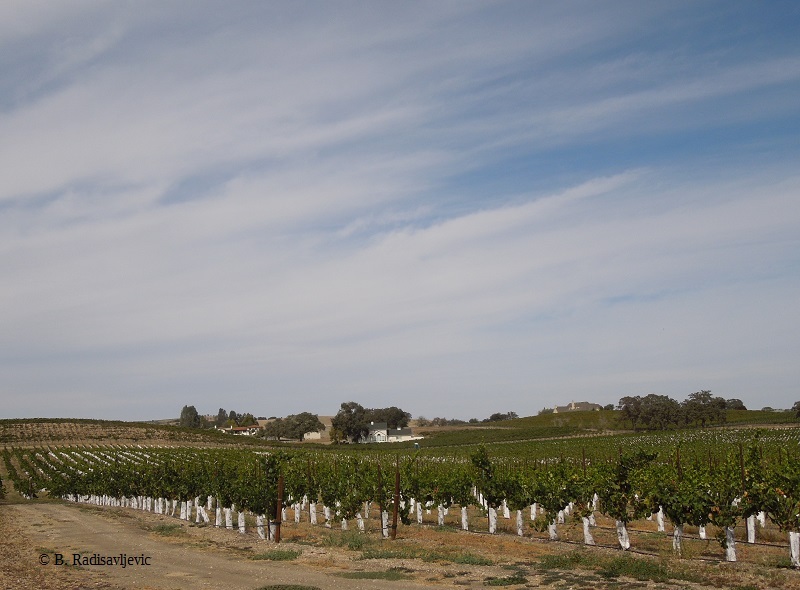 It was hot today in Paso Robles -- 102 degrees. It was hotter yesterday and stayed hot at night. So I was pleasantly surprised to walk out to my car about 6:30 and feel a cool breeze. When I was ready to leave for the gym a short while later, I walked out to see this moon surrounded by pink clouds. It's supposed to stay cool tonight and only be in the eighties tomorrow before turning hot again for the first day of autumn. Fortunately, the night temperatures are supposed to remain in the fifties all week. It's wonderful to be able to turn off the air conditioning at night and remain comfortable by opening the windows. Right now I'm in front of an open window with a cool wind blowing on me. 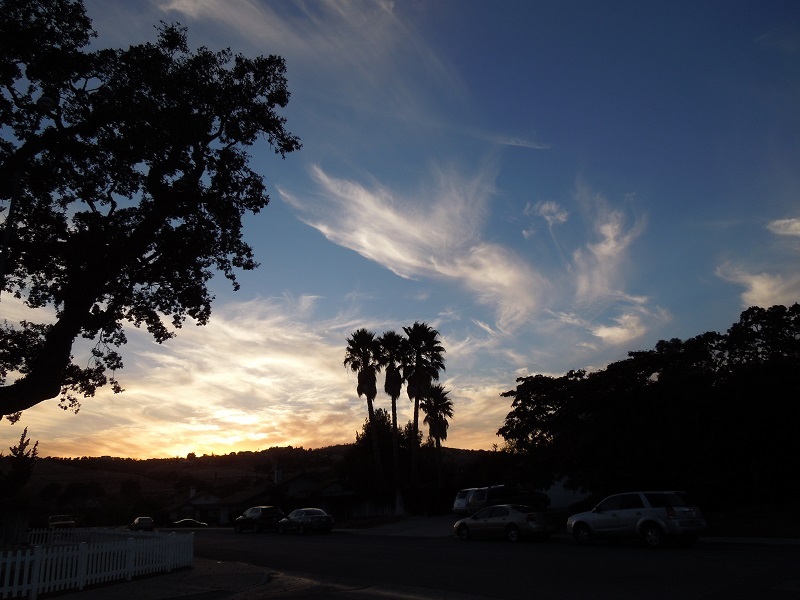 I love the sky views we have here in the North County. I'm definitely a sky watcher. Are you? 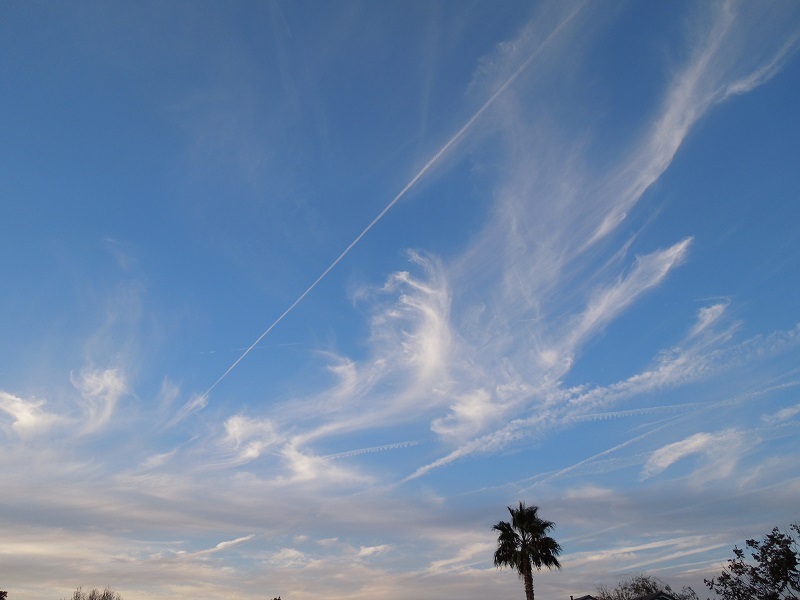 Here are some of my other sky shots. There are more sky photos here. I noticed this statue of a horse last week when I was driving by it on Spring Street. I don't know if it's new or whether I had just never noticed it before. 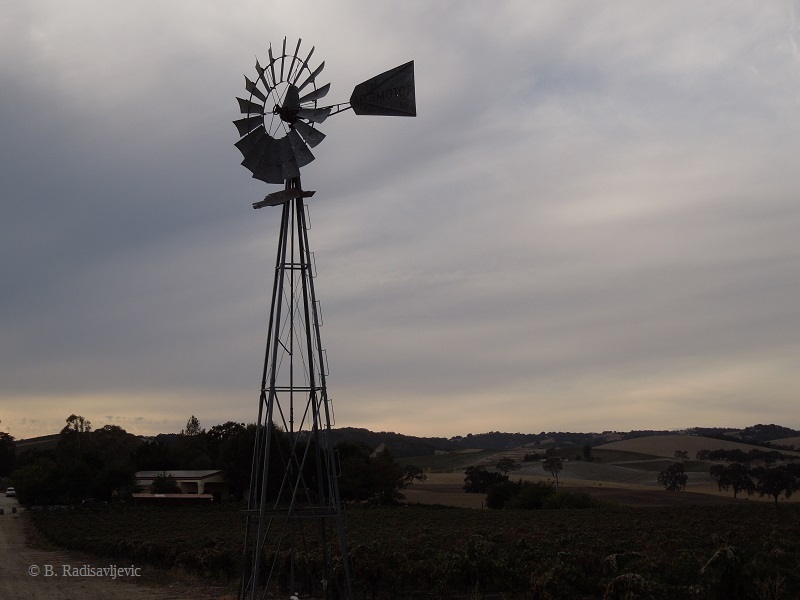 It dominates the front yard of the Rossi Law Offices in Paso Robles. 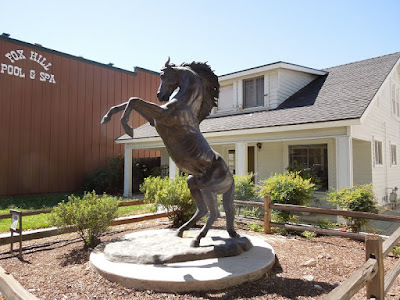 I was not able to get any information on the artist from the statue, but an online search told me the horse statue has been named Veritas, which means "truth." Evidently there was a contest to name the statue and the winner who came up with Veritas is Erik Mauk from Atascadero. I'm looking forward to possibly discovering more art where I least expect to see it -- art outside the marketplace or the galleries. 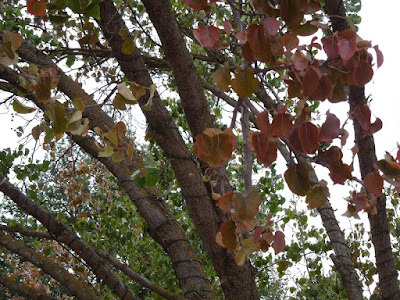 As I was walking in the park this week I took a careful look at the trees. After only a few cool days, I noticed this ornamental pear tree was beginning to get some red leaves. If you click to enlarge this photo, you may also see the tiny bronze-colored ornamental pears near the leaves. 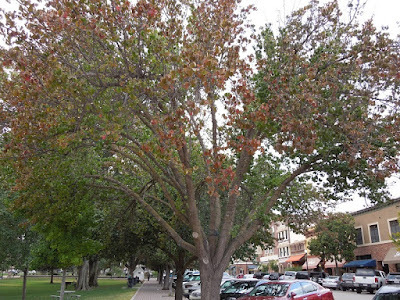 This photo shows the entire tree along with other trees lining 12th Street in Paso Robles. As the leaves change, why not decorate your table to note the changing season? 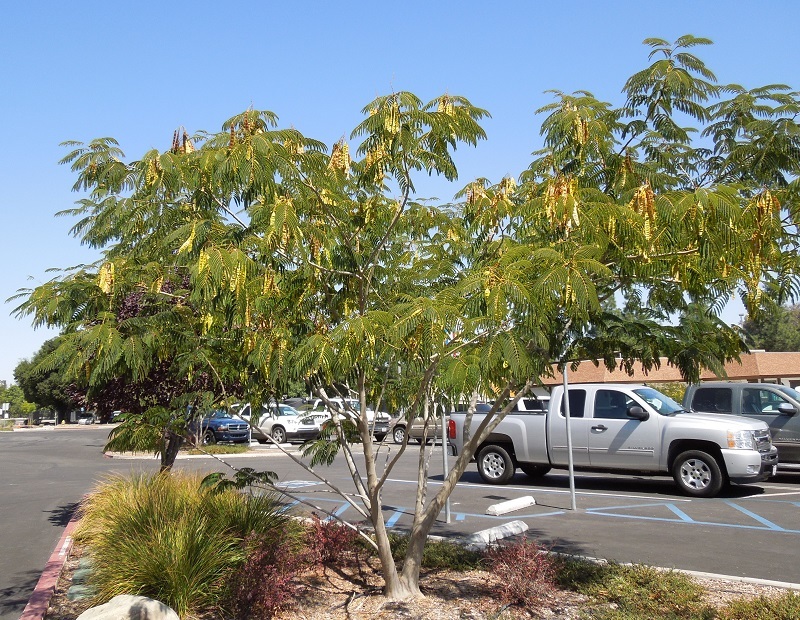 The items below feature pepper tree leaves in autumn. The place mats and napkins are 100% cotton and will last a long time. The hard plastic coasters come in a set of six and have a glossy surface and cork backing. You can order any of them with a click.